Well, things have finally slowed down, and I feel like I have some time to blog again. I haven't stopped any projects, but I've recently being doing nothing but projects. We're in the new house on 19th and Washington--and we LOVE it. 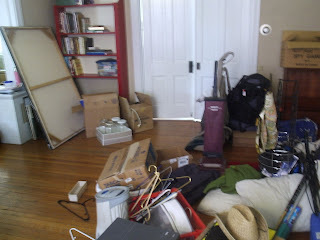 It's a really old place with wood floors, big doors and the sweetest landlady we could ask for. 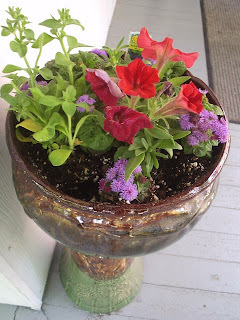 Before doing much unpacking, I was determined to get some flowers on the porch: 3 hanging baskets, 1 window box (1 out of 4 done), and a standing bowl...it just makes me feel happy every morning when I go out to water them. 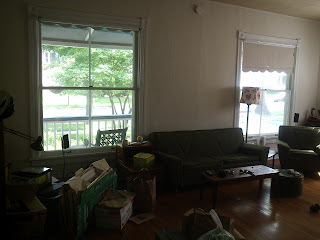 Below are some pictures of the house...really bad pictures, and we're way behind on unpacking so--look at those huge windows! We'll get there. 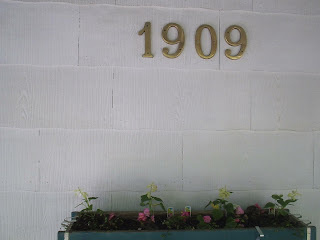 At least my flowers are looking good, the herbs are up and the garden is planted--more on that later.